I was right! – Boo-Ya! Incredible Hulk Out Oct 21st! Marvelousnews.com reports that The Incredible Hulk is comikng out Oct 21st – which is what I said! Man,. I love when I’m right! Click on the image for the link! – Have a good weekend! I found this custom – man those mighty muggs are quite perfect for customizing! 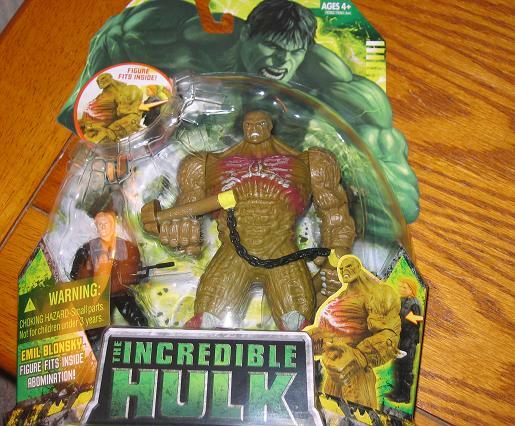 The King Hulk comes with a sword and an axe and looks really perfect. Click on the image for the auction – the only thing is that the auction has a reserve, and I’ve already told you how I feel about reserve auctions… (ugh!) What not just do a Buy It Now or Best Offer? Those make WAY more sense. These are just a couple of packs that are out right now. They have party plates and cups – Okay, listen, I didn’t buy these! They were bought for me! 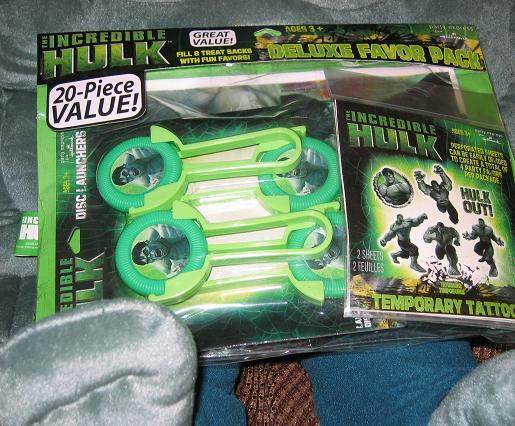 I love my Hulk collection but what the hell am I going to do with these? You can’t even display them! I love the action figures – I love the statues – I really love the comics – but I never get this kind of crap. 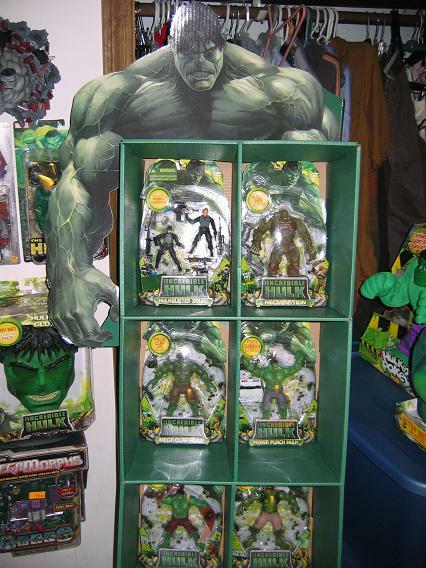 Hey I love the Hulk but this is a little overkill. 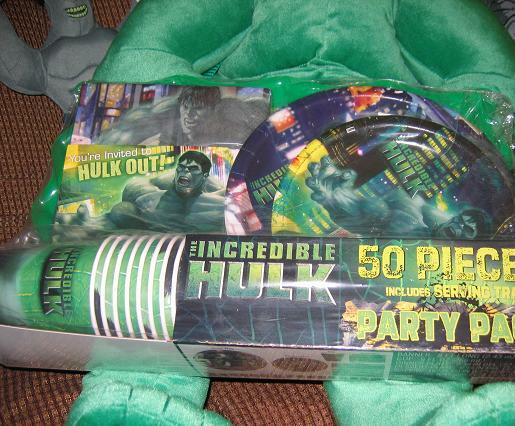 So, until my birthday, I have a few party packs to decorate my room. I know that’s a crappy thing to leave you with over the weekend – but I have the final SHS figures from wave 2 coming up next week as well as Wave 3 arriving Tues. or Wed. I have a lot better for next week as well as the review for Skaar #’s 2 & 3 – I waited to give a review for #2 because… well, I forgot. Sorry. See you Monday Hulkatics! So, yeah, it holds all the new Hulk movie figures perfectly – all but the 2-packs – but it is great and has the Hulk’s head, chest and right arm on top of the figure holder. 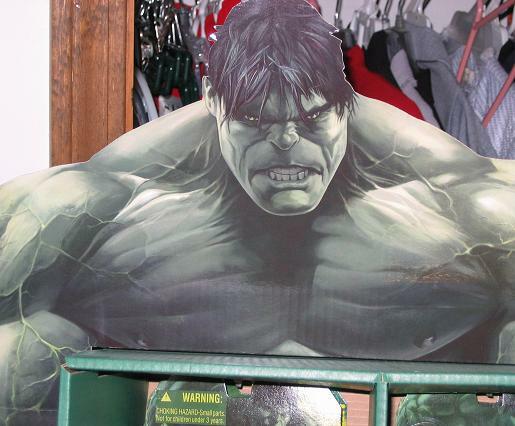 I was pretty psyched because this was the first item that was given to me from the Hulk movie memorabilia. Then of course the Toys R Us display and the SHS box from Wal-Mart. What? I didn’t show you the SHS box yet? Oh just wait! It’s awesome! Coming soon! Hulk Season 5 – Out Oct. 21st! Take a look at the cover art to the final season of this series. It’s due out on October 21st – as well as the COMPLETE SERIES set! To see it click on the image and go to the site that announced it. Now, they haven’t mentioned the Hulk movie release date yet – but I am betting it’s going to be on the same day. Mark my words! 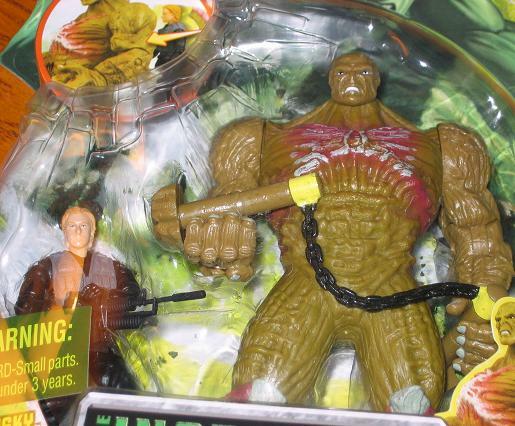 While the Gamma Charged Abomination has still eluded me I did find the third Abomination figure made from the movie. It’s the 2-pack with the Emil figure. The Emil figure fits snugly inside the Abom figure – but again, much like the Mutating Hulk figure, there has to be a sacrificein articulation. The waist does not move – but he does come with a pair of nun-chucks! Much like in the movie where the Abom broke off some concrete poles and used them in the final fight this figure has the chucks to swing around! I am still pretty impressed by the likeness in the Emil and Banner figures. Emil looks just like Roth! The Banner figure looks just like Norton. They may fit in perfectly with the G.I. Joe figures – and can you imagine!?! Hulkbusters against G.I. Joe figures! The Hulkbusters would win for sure! They have to deal with the Hulk on a daily basis – what do the Joes have to handle? A couple of guys in silver masks who scream alot? Please… no contest! Close up - of the sweet nun-chucks! Aaaauuuuggghhh! 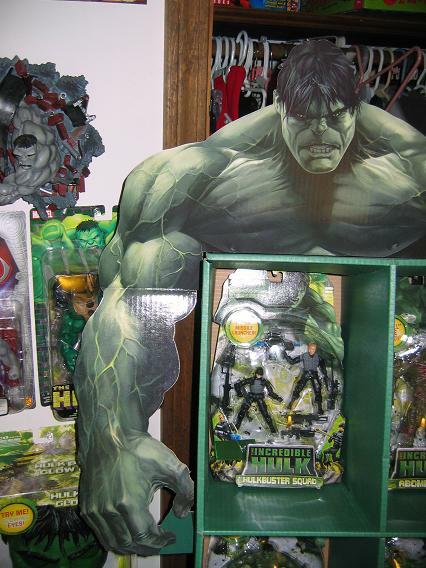 Where is Hulk’s arms!?! Why is the Hulk such a fatty!?! And where did he get those fantastic bunny ears! Goodness gracious.